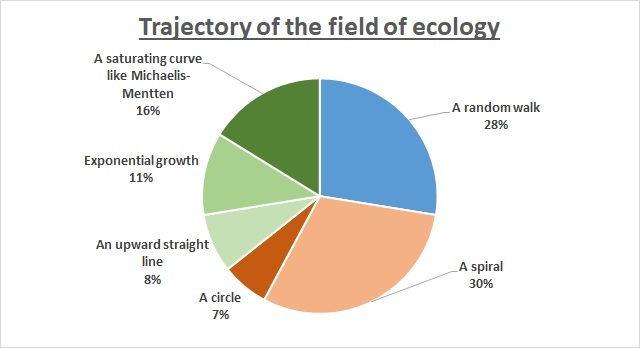 I recently surveyed our readers on what shape they thought the overall trajectory of ecology took. It was a fun post with a number of good comments. First I set up the question and polled the readers what shape they thought the overall trajectory of progress in ecology took. Then I argued in some detail that it was circular or spiral (and explored what this implied). So its hard to know how many readers truly took the poll before reading my argument, and of course the subset of our readers who chose to answer a poll is clearly not random in a scientific sense. But here are the results. We had just over 200 respondents. Of these about 10% answered “other” and described their own trajectory. These are interesting and I’ll mention some in a minute. But of those who went with one of the six choices I provided 37% went for circular or spiral, 35% went for some version of systematically increasing (linear, exponential or saturating) and 28% went for a random walk, so very roughly 1/3, 1/3, 1/3. Of course random walk is interesting because it contains elements of both circularity and a trendline (most random walks look like they contain a trend but also have noise and are likely to return to the beginning at some point). The spiral was far more popular than the circle, although some agreed with me that the vertical gain in the spiral was only methodological, but others felt the vertical gain of a spiral was an important feature. I thought I would find a strong link between career stage and view of trajectory shape, but I didn’t. There might have been a weak signal of a U-shape (early career and late career being more likely to pick one of the upward trends and middle career – postdoc, early permanent position – more likely to pick a circle or a random walk), but I didn’t see a strong enough effect size to want to pursue it further (read-only link to the data here: https://docs.google.com/spreadsheets/d/12AAXpbEwTbvW9_OmRxeJZwjGZM3eLl5ZlyudwhlnOwk/edit?usp=sharing). Probably the most comprehensive answer under “other” was “A combination of gentle progress superimposed with a lot of random noise and occasional bigger and more frequent smaller jumps (and “epicycles” within certain topics as they get rediscovered and renamed)”. It would be hard to disagree with that and that is probably a good place to end! I picked (upward) spiral, but I’m curious how many of our readers think I wrote in “downward slope” or “digging a deeper hole in a dark pit”.